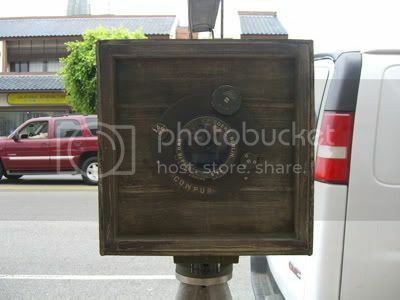 Along First Street on the sidewalk in front of the old Nishi Hongwanji building that is now part of the Japanese American National Museum is a wooden box on a tripod that looks like an old style camera. 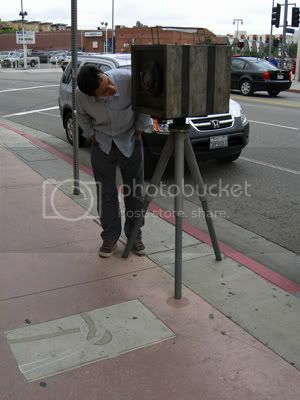 I work in Little Tokyo and I often see people looking at the box trying to figure out what it is. Do you know? First-generation Japanese American photographer Toyo Miyatake (1895) opened his photography studio in Little Tokyo in 1923 and spent the rest of his life documenting his community's life on film. When Miyatake, his family and 120,000 Japanese Americans were unjustly incarcerated by the U.S. government during World War II, Miyatake bravely smuggled a camera lens and a film plate, considered contraband, into the Manzanar concentration camp in California. Using a secretly-constructed camera, he captured everyday life in Manzanar. Artist Nobuho Nagasawa created a three-times-as-large bronze replica of the Miyatake camera in homage to Toyo Miyatake. The sculpture projects slides of Miyatake's work onto a window of the Japanese American National Museum each evening. This sculpture was commissioned by the Community Redevelopment Agency and was first installed in 1993.